There are several ways to measure investment performance. One such useful measure is the Sharpe ratio, created by Nobel laureate William Sharpe in 1966. It is widely used because it combines annualized returns with risk into one single number. Why does it matter to combine returns with the risk levels in a single figure? Let me illustrate through a simple example. Say you don’t like risk very much. So you invest your money in short-term government bonds, earning a modest interest rate with hopefully very little volatility. Then consider your best friend who’s at the other risk extreme, buying small company stocks (aka small caps). These stocks are very volatile, possibly with a beta of 2 or more. The burning question is now this. Is your portfolio of bonds better than your friend’s small-cap stocks portfolio? Extending this a bit further, is there a “perfect blend” of the two that would maximize your return while keeping your overall risk manageable? Many folks in academia have studied this issue ad nauseam and developed models to address this supposedly simple question. You may have heard about the capital asset pricing model (CAPM) or the efficient frontier concept of modern portfolio theory for example. All these concepts are interesting to the academic mind, but not very practical for an individual investor. They lack simplicity and frankly, they don’t work very well in practice anyway. However, one simple measure stands out and I must admit I use it all the time: it’s the Sharpe ratio. This is because it is simple to calculate and it allows me to compare multiple investments at a glance on a simple spreadsheet. Take a look at the following chart. I’ve plotted SPY, the S&P 500 ETF, and IEF, an ETF that buys 7 to 10 years US government treasury bonds. 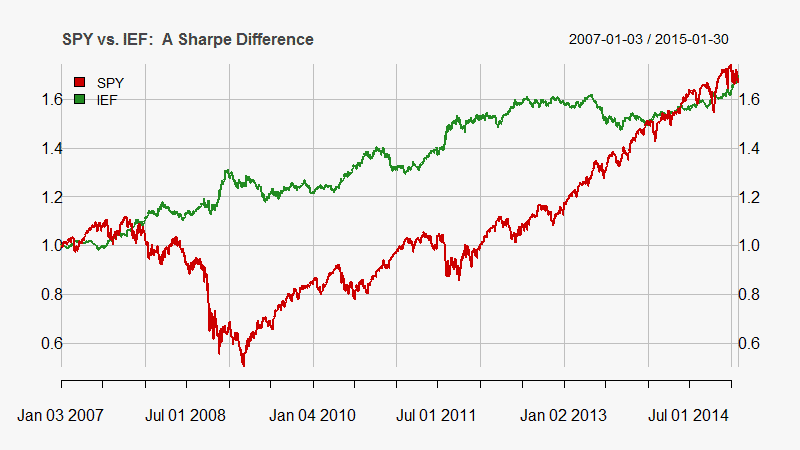 The analysis time frame is January 2007 to the end of January 2015. Looking at a chart like the above tells you a good story via a picture. But if you are looking for a single number, so you can compare different ETFs and get a sense of the risk/return equation, then the Sharpe ratio is what you want. Not surprisingly, we see similar annualized returns (first row). The risk measures, however, are very different: maximum drawdown is 55.2% for SPY vs. 10.4% for IEF. Standard deviation tells a similar story, at 22.14% for SPY vs. 7.43% for IEF. 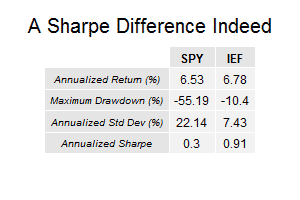 And last, the Sharpe ratio for SPY is only 0.3, whereas IEF is 3 times better at 0.91. Comparing the Sharpe ratios, in this case, tells you that investing in IEF was in essence 3 times better than SPY on a risk-adjusted basis during that time frame. Now here’s my favorite part, the geeky part. 🙂 In its simplified version, you calculate the Sharpe ratio by dividing the annualized return (CAGR) by the annualized standard deviation (SD). That’s it! How’s that for geeky math to impress your friends! 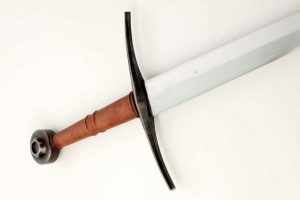 The original definition by Sharpe is somewhat more involved because it includes an adjustment for the return and the standard deviation by comparing it to the so-called risk-free interest rate. These can usually be ignored in most practical cases, and particularly in the current environment when interest rates are close to zero. Still, I encourage you to have a look at the Wikipedia page on the Sharpe Ratio if you want to learn more about this important measure. The Sharpe ratio has two quantities: the annualized return and the standard deviation. So where’s the third edge? It is the analysis time frame, and it is embedded in the CAGR and SD numbers in the above equation. This is extremely important to understand. If the time frame is too short, then you are bound to potentially get a very misleading Sharpe ratio. In practice, consider at least one full decade or more and at least two full economic cycles. The goal is to get a sense of the return and the volatility of the security in different market regimes, so you get a better appreciation for the risk/return tradeoff. In that sense, the longer the time frame the merrier for the Sharpe ratio. The chart I showed above used a time frame that is too short to show a meaningful Sharpe ratio (remember this was for illustration purposes). Because of the type of market we’ve had since 2008, which have been fueled by low-interest rates and quantitative easing, IEF looks overly good, while SPY looks pretty bad due to the crash. The future is sure to be different from the recent past, especially now as the Federal Reserve is looking at increasing rates (bonds go down as interest rates increase). So to get a better sense of the Sharpe ratio, it’s best to go further back in time and include different market regimes. For a bond analysis, always include a raising interest rate environment to get a better sense of the downside risk. Always keep these things in mind when doing your analysis.